The Ingleburn RSL and Campbelltown community pipes and drums band was formed 40 years ago. It is arguably NSW’s busiest pipe band, with one or two engagements every week until Anzac Day this year. But some of its members are getting a bit long in the tooth, and while it’s not exactly an existential crisis at the moment, the band could do with an injection of youth sooner rather than later. “Our oldest snare drummer is 87 and the other one is 68 so we are definitely looking for younger blood to come into the band because the older members can only go for so long,’’ says pipe major Peter Jakobsson. “We have an average age of 60, even though our youngest member is 14,’’ he said. Pipe major Jakobsson, who was named 2017 Campbelltown citizen of the year, said high on the band’s wish list were snare drummers. “Members come and members go, but at the moment we are definitely short of drummers. At the moment we only have about two snare drummers,’’ he said. Fresh blood needed: local MPs Anoulack Chanthivong and Greg Warren with members of the Ingleburn RSL and Campbelltown Community Pipes and Drums band. The band enjoys the support of both local MPs, Anoulack Chanthivong and Greg Warren, who have joined the call for an injection of youth. Mr Warren, himself a musician many years ago, has urged local drummers to consider joining one of Macarthur’s oldest bands. 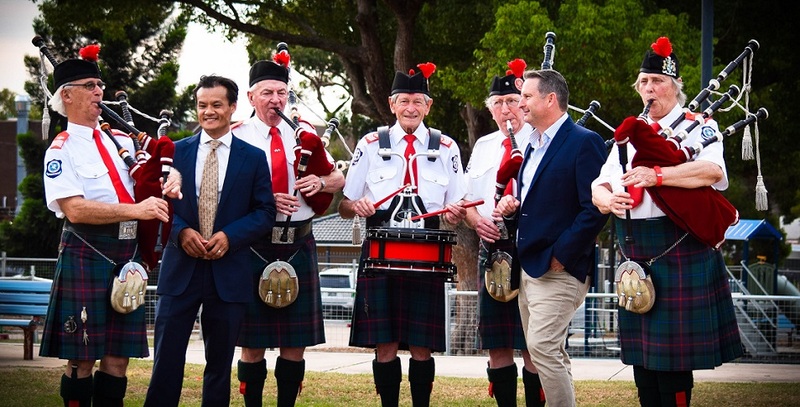 “There are so many wonderful organisations who contribute immensely to the Campbelltown community – the Ingleburn RSL and Campbelltown Pipes and Drums are one of those groups,’’ he said. “The band has made a tremendous contribution to the community by playing at local events and it would be a terrible shame if this could no longer occur due to a lack of members. Mr Warren said any local musicians wanting to join a band should contact the Ingleburn RSL and Campbelltown Community Pipes and Drums band, which practises every Thursday night at Ingleburn RSL.